Premium quality 316L surgical stainless steel (lead free) aromatherapy essential oil diffuser necklace pendant. Includes 24 inch stainless steel chain, 5 washable cotton pads (pink, white, yellow, green and purple), all in a gift box making it the perfect gift for any occasion. To use add up to 5 drops of your favorite essential oil or aromatherapy oil. Adjust number of drops as needed or combine oils for custom combinations. Aromatherapy on the go. Its perfect because you are never without your favorite aromatherapy. Enjoying the scent of your favorite essential oil without the oil touching your skin or getting on your clothes. 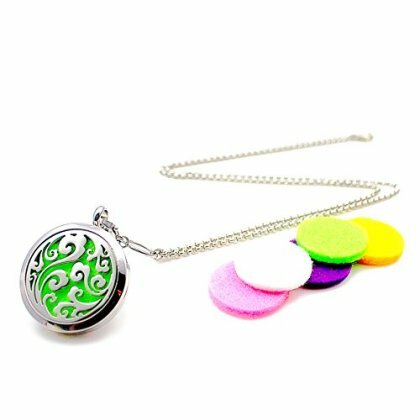 The locket stays closed with the help of 2 powerful magnets to ensure the pad stays in place. These diffuser necklaces make the best personalized gift for that hard to shop for person. Perfect for family and friends and even yourself. Who doesn't need a little pampering!